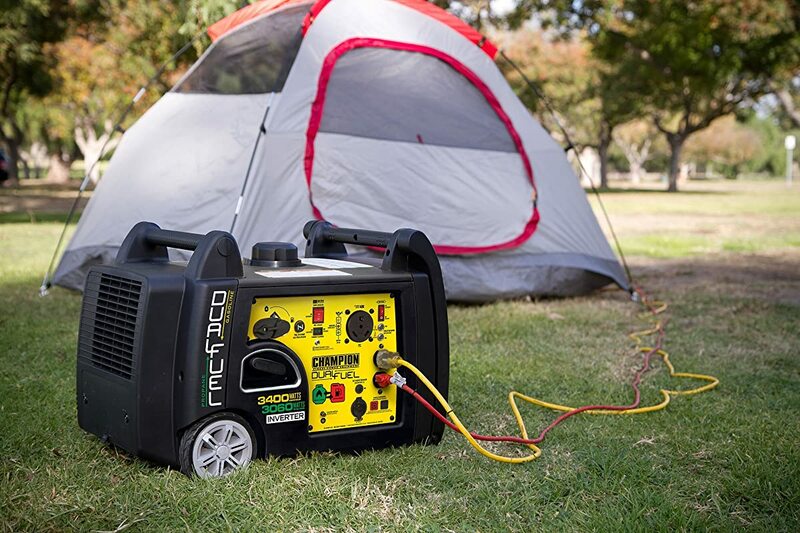 Best Portable Inverter Generator 2019: Top Reviews for Efficent, Quiet and Cheap! 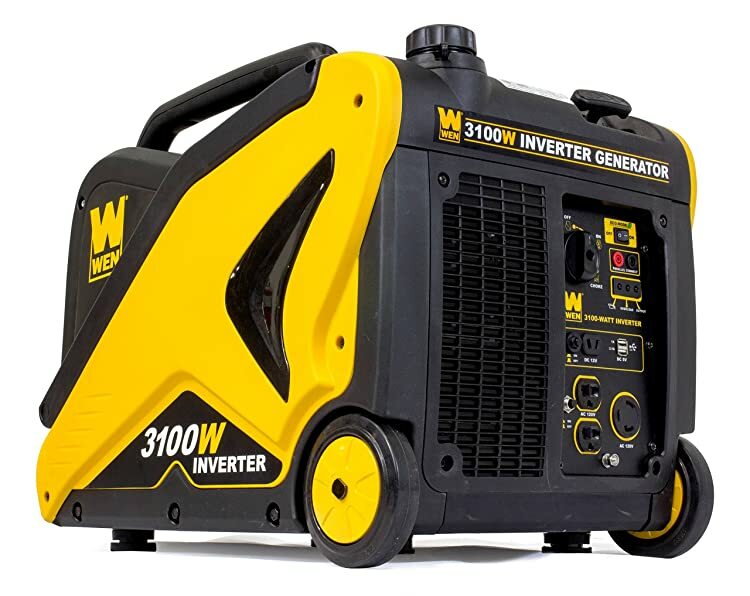 →Best Portable Inverter Generator 2019: Top Reviews for Efficent, Quiet and Cheap! Have you ever planned a much-needed week at a remote cabin? A few beers, a bonfire…a little bit of unwind time with the guys? We did and it was great, until the power failure came that is. Needless to say, we didn’t even pack candles – who would have thought?! 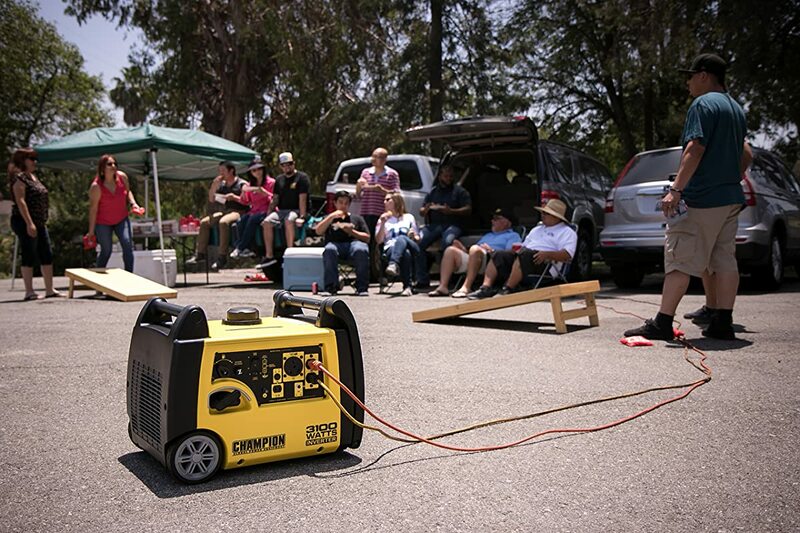 Well, many people actually laughed at us for not having an inverter generator on hand. Yes, we know, but we’re more of the office, tech-oriented kind, not so much the outdoorsy, always prepared, Bear Grylls-type. But now we do know better so we actually embarked on a self-imposed mission to find the best damn inverter generator there is. First thing is first. 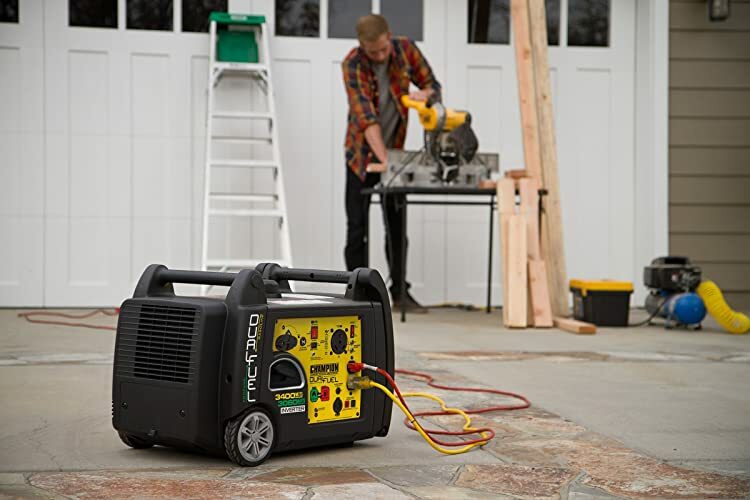 Though there are numerous types of portable generators out there, apparently the inverter kind is the better option. The inverter stage placed between the actual generator and the power source will ensure that the frequency and voltage are controlled with a high precision. Noise level – We advise you pick a unit that makes around 50-60 dB. You will especially love this perk if you happen to park in an RV lot and so will your neighbors. Portability – In case you are not Superman, opt for a lightweight, compact model. There are quite a few good ones on the market so there is no need to break your back trying to carry around 150 pounds. Fuel efficiency/ run time – Most of the better inverter generators on the market are gas based, though there are some that can run on multiple fuels. Keep in mind though that no matter the gas tank’s size, what is important here is the exact amount of fuel consumed per hour. 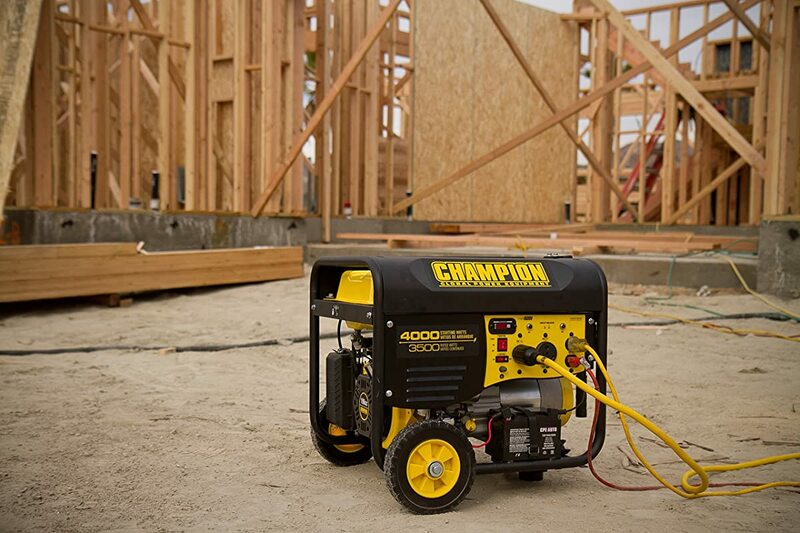 A good generator will run around 8-10 hours on a full tank, depending on the load, of course. Pairing option – This feature will allow you to pair multiple units of the same kind, leading to a longer running time. Keep in mind though that it is better you get a great unit than pair two average ones, at least price wise. 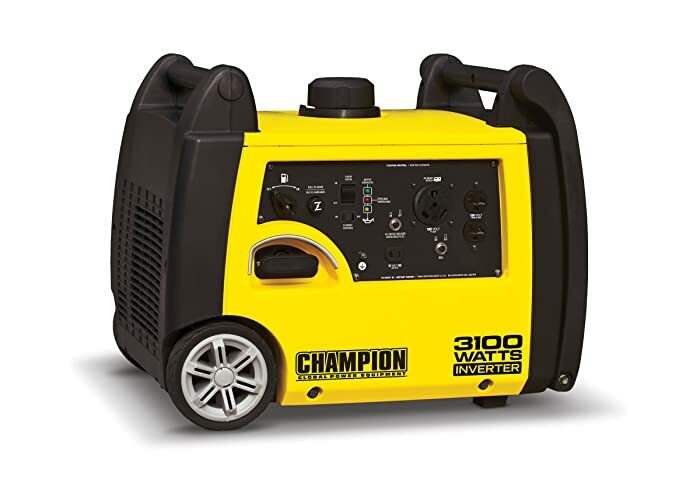 Though not as noise free as the previous model, this inverter generator from Champion Power Equipment is also a pretty nice choice. As opposed to the Honda unit, this one comes equipped with a cold start engine. We have to say we do like this as the generator will have a good, smooth start even in very cold weather. Power wise, you will find that the 46539 model is able to both start and run a 15,000 BTU RV air conditioner without any hiccups. This might have something to do with the very powerful 196cc motor, able to produce about 4,000 starting and 3,500 running watts. We find this one pretty great compared to other models in the same class. Another, perk we have to mention is the fact that this unit comes equipped with all the outlets you will ever need, all secured by a Vault Guard. You will find this extremely helpful in case of a power surge – no appliances will ever suffer the consequences. On the downside, it is quite heavy and if you were already complaining about the previous model you will have a shock at this one’s over 130 pounds. Also, the gas tank can only be filled with a tiny flow, and this is a pain indeed. However, we do have to say that the remote start will redeem any inconveniences you might experience with this unit. Another good option to keep in mind is this very quiet Wen model, producing only about 57 dB when at a ¼ load. Its design does minimize any noise produced and it is CARB and EPA III compliant. What we like most about this unit is the 212cc motor (4-stroke OHV), very powerful, more than many other engines around. As with most, if not all, better quality inverter generators on the market, this one also produces a cleaner-type of energy, especially beneficial if you use it to charge sensitive electronics. Rest assure as no iPhones will burst into flames here. Another perk comes in the form of an automatic low-fuel shutdown. You will find this overload protection feature particularly beneficial in case you forget to replenish the oil. You might also like the eco mode option, one that is not carried by every single model on the market.On a darker tone, while the tank is quite large (well, larger than others, coming at 1.85 gallons) this unit is only able to power up to 7.5 hours at half load. You will also probably hate the weight of this unit, 81.4 pounds. We do not particularly have a problem with this fact, but it does need 2 people to properly carry it. This isn’t what you would call lightweight. It’s a 64-Ounce bottle, of course, you should expect it to be heavy.• When you leave it under the sun for quite a long time, unlike other bottles that take at least a few hours to heat, this one would just take ten minutes and then boom you have enough heat to cook eggs on top of the steel. 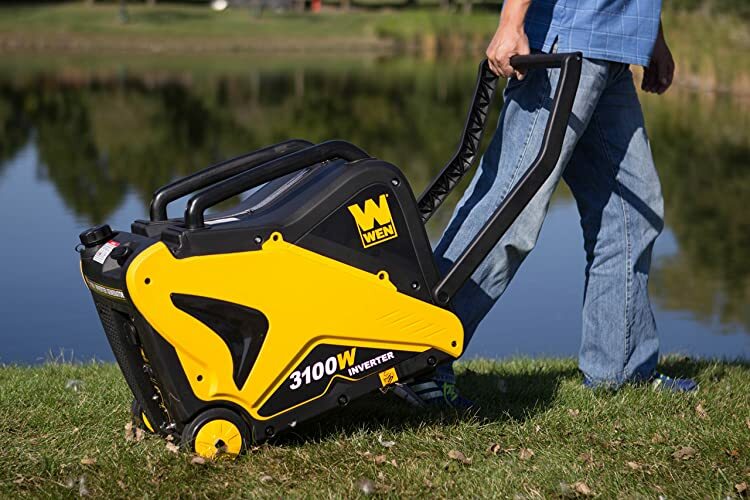 This other model from Champion Power Equipment is a nice choice for those wanting a fairly lightweight, easy to carry unit – it weighs about 99 pounds. While we are not exactly sold on the lightweight part – we have tried some lighter models – the weight is pretty well distributed and the built-in carry handles do help a lot. As a plus, this unit is very quiet, producing only about 58 dB, a lot less than people at Walmart. You know what we mean! This feature does turn this model into a nice addition to your RV road trip and so does the RV-ready outlet combo. Keep in mind that you might need to start using fuel conditioner to have the unit in top-shape for longer. The downside, if you turn the economy mode off, the generator will not match the power to the load – it will run at maximum with just a toaster plugged in. That being said, there is a plus to turning it off – the start will be a lot smoother and so will the run if there are any inductive-type loads. 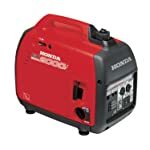 This model from Honda is arguably one of the most silent ones on the market, producing only about 59 dB when at a rated load and about 53 dB when at a quarter load. Needless to say this is our favorite feature and perhaps yours too. It will make less noise than your kids…or you at Starbucks. The starting system is recoil based, making the entire unit work beautifully. One thing you should keep in mind is that this inverter will run about 3.4 hours/ tankful when at a rated load and about 8.1 hours/ tankful when at a quarter load. 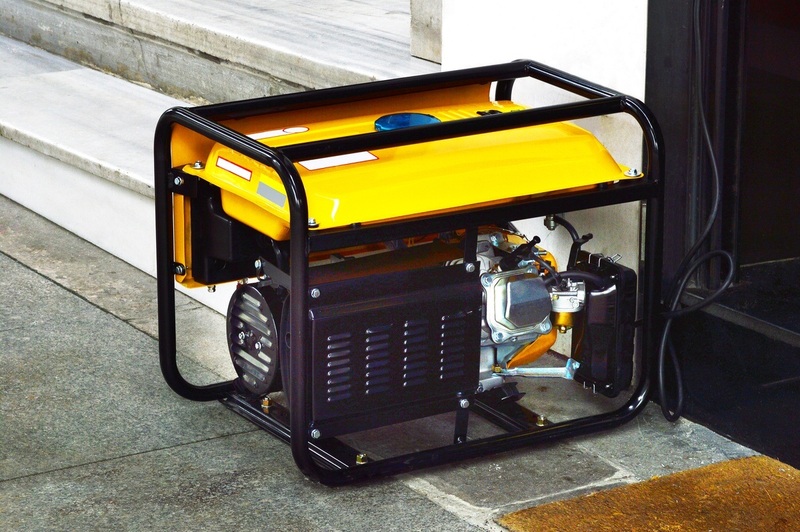 Another plus comes from the fact that the generator does turn off if the oil (gasoline) amount reaches extremely low levels, preventing any problems related to overheating. We have to say this oil alert Honda has come up with is a nice added surprise for many, especially if you are quite keen on using multiple generators in tandem. On the downside, this unit is a bit heavy for some, coming up at about 69 pounds, though we do not have any particular problem with this. We find it quite compact and easy to carry thanks to the evenly distributed weight. 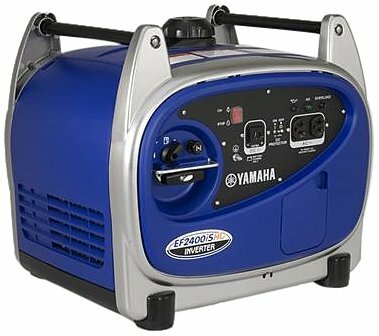 Another good option to keep in mind comes in the form of this Yamaha model, priding itself on providing a cleaner form of energy. One of its best features is the fact that it will adjust the engine speed to match the given load. Power wise, the motor is pretty powerful and has a nice start. It will be able to power anything from air conditioners, ovens, both convection and microwave, and even the largest blow dryers on the planet. However, what we like most is the motor damage prevention in case of low oil levels. Yes, this is something along the lines of the Honda model – Japanese workmanship, mind you.This one is a little bit lighter than most units on the market, coming up at around 75 pounds, not a lot in our book. Keep in mind that though the generator hold 1.5 gallons of gas it does consume a lot of fuel. 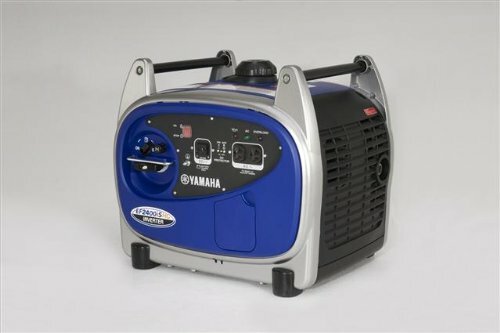 This might have something to do with the 5.5Hp engine.The fact that it is quieter than most generators on the market does take away from any inconvenience, especially if you are going to use it on your RV. Your neighbors will not cuss at you on a daily basis. 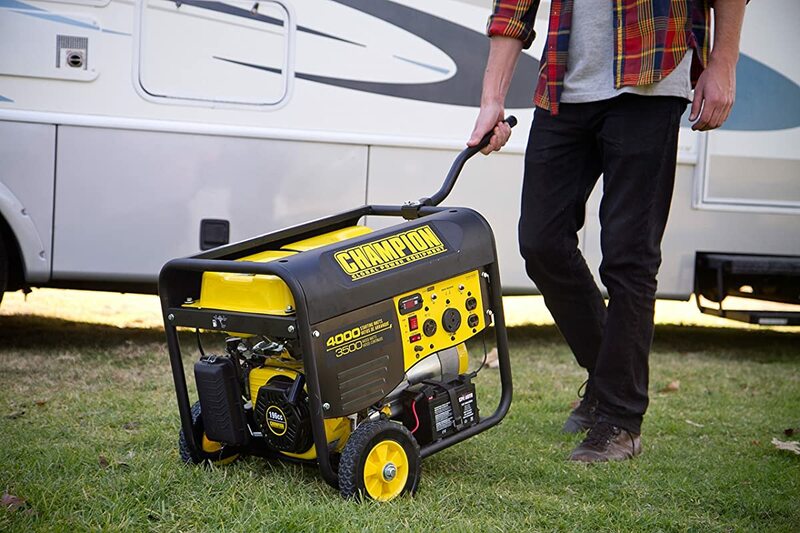 This model from Champion Power Equipment comes with a nice surprise for many, being able to handle two fuel types, namely propane and gasoline. We do like this feature and you might also. It will run up to 7.5 hours on a full gas tank, and up to 14.5 hours on a 20 pounds propane one. Keep in mind that the gas tank is a fairly small one and you might want to opt for the propane alternative for an overnight use. You will find it a lot more efficient. Another thing to consider is that if you run the lights and AC, keep the water heater in gas mode. Also very quiet (producing only 59 dB) this model is arguably one of the best choices for taking with you on an RV trip. Weight wise it is a bit on the heavy side, coming up at 95.7 pound, albeit being fairly easy to maneuver and carry around on a flat, hard surface. We do find that the incorporated handles help a bit.The 192cc motor is quite powerful, though there are some better ones on the market. Nevertheless, this unit will be able to tackle a hefty load. What we think redeems it, is the ability to be connected to another inverter, thus providing more power if you desire. 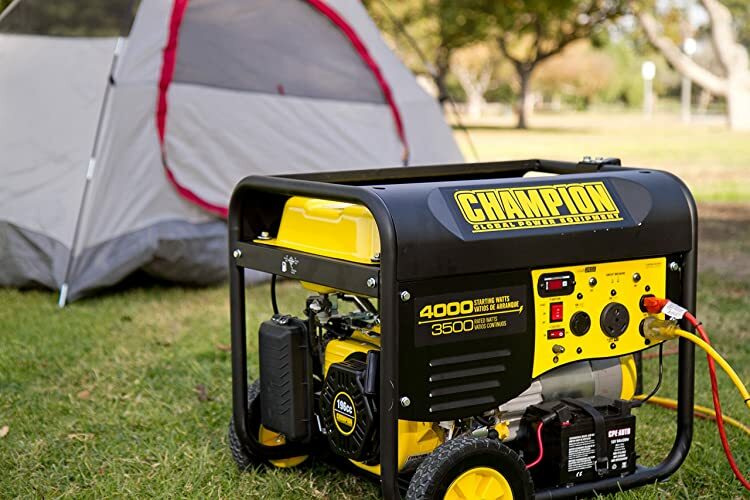 It should come to no surprise that we picked the Champion Power Equipment 46539 3500 Watt RV Ready Portable Generator with Wireless Remote Start as our top choice. Also, depending on the load, it does tend to power for a fair amount of time. Yes, it is a bit pricy, but considering the quality and the many added perks, it is worth it in our opinion.The money is not just for the brand. This model comes with a remote fuel tank option, powering up to 72 hours straight without refill and a low-gas shutdown alarm. Keep in mind that it works best with premium, less than 10% ethanol gas, and we did find that out the hard way. Don’t be like us!